Third time on Oceania, first time on the R-Class Nautica. Had a great time on this 30-day cruise up the east coast of Africa and then Asia seeing some out of the way places but meeting some great people onboard. The biggest detractor on this cruise was time and how long it takes to get from point A to point B. Itinerary Planning - This is a shared responsibility between Oceania Corporate and the Captain of the ship. These itinerary’s are made years in advance and must be executed by the Captain at the helm. Durban - 3 hours late, Maldives - 5 hours late, Phuket - 5 hours late - Unacceptable. The reason given, currents were bad or wind was high. This tired ship can only do about 18,5 knots, we didn’t have high seas or storms to contend with, this was an example of poor planning and not having enough time reserve between ports of call. The skip of Mombasa for terrorist threat is understandable but could have been communicated sooner, the add of Praslin in the Seychelles deserves an “At a boy”. Ship - Loved the size of the ship and the old world charm but its time for an upgrade. The common areas were in good shape and are still receiving the TLC they deserve. Would like to see Toscana and Polo combined to make room for Red Ginger with the scheduled refurbishment. The Nautica Lounge has a nice layout to it but when the entertainment uses the dance floor instead of the stage it can be difficult to see what is going on. Didn’t see a lot of activity in the casino, this space could get better utilization. Enjoyed the spa deck on the front, a quiet space for reading, and the hot tub there was great. Dining - Ate in all the venues and service level was top notch. This was really evident in the Terrace Grill. During the morning rush there were countless “Good Mornings”, tables were reset quickly, and beverage servers ever present. Enjoyed the regional specialty nights especially the game night of Kudu, Springbock, Crocodile, and Impala. For the GDR did not experience the same quality as previous sailings, the deserts were routine. Saw the same menus in Toscana and Polo as year prior, shouldn’t these change a bit. Entertainment and Activities - You can’t expect the same performance level that is received on a 2500+ passenger ship. With that said this group or entertainers and dancers held there own and then some. You got to know these performers throughout the 30-day cruise as they were the ones hosting the various activity games onboard. I think you will see Paulina and Luke have their own headline acts soon. John’s comedy/magic show should become a regular act. He was pretty darn good at having fun at the daily trivia forum. Was glad to see bridge lessons being offered as corporate had said they wouldn’t prior to the cruise. Bridge should be expected on a cruise of this duration. The string quartet every evening in the atrium was well received and glad to see them get two headline shows. The off-board entertainers and lecturers were pretty good. Ports and Shore Excursions - Took this cruise mainly for the itinerary and was not disappointed. Arranged mostly private tours with the CC forum prior to embarkation. These were well done and received a more intimate experience than the Oceania sponsored trips. The tendering process was orderly with a sensitivity to private excursions. Oceania needs to cut their fees in half to be competitive. Met some interesting fellow travelers from various points of the world. By sharing evening dinner or Happy Hour you get to exchange in some great conversations. We enjoy Oceania and will return. Third time on Oceania, first time on the R-Class Nautica. Had a great time on this 30-day cruise up the east coast of Africa and then Asia seeing some out of the way places but meeting some great people onboard. The biggest detractor on this cruise was time and how long it takes to get from point A to point B.
Itinerary Planning - This is a shared responsibility between Oceania Corporate and the Captain of the ship. These itinerary’s are made years in advance and must be executed by the Captain at the helm. Durban - 3 hours late, Maldives - 5 hours late, Phuket - 5 hours late - Unacceptable. The reason given, currents were bad or wind was high. This tired ship can only do about 18,5 knots, we didn’t have high seas or storms to contend with, this was an example of poor planning and not having enough time reserve between ports of call. The skip of Mombasa for terrorist threat is understandable but could have been communicated sooner, the add of Praslin in the Seychelles deserves an “At a boy”. Ship - Loved the size of the ship and the old world charm but its time for an upgrade. The common areas were in good shape and are still receiving the TLC they deserve. Would like to see Toscana and Polo combined to make room for Red Ginger with the scheduled refurbishment. The Nautica Lounge has a nice layout to it but when the entertainment uses the dance floor instead of the stage it can be difficult to see what is going on. Didn’t see a lot of activity in the casino, this space could get better utilization. Enjoyed the spa deck on the front, a quiet space for reading, and the hot tub there was great. Dining - Ate in all the venues and service level was top notch. This was really evident in the Terrace Grill. During the morning rush there were countless “Good Mornings”, tables were reset quickly, and beverage servers ever present. Enjoyed the regional specialty nights especially the game night of Kudu, Springbock, Crocodile, and Impala. For the GDR did not experience the same quality as previous sailings, the deserts were routine. Saw the same menus in Toscana and Polo as year prior, shouldn’t these change a bit. Entertainment and Activities - You can’t expect the same performance level that is received on a 2500+ passenger ship. With that said this group or entertainers and dancers held there own and then some. You got to know these performers throughout the 30-day cruise as they were the ones hosting the various activity games onboard. I think you will see Paulina and Luke have their own headline acts soon. John’s comedy/magic show should become a regular act. He was pretty darn good at having fun at the daily trivia forum. Was glad to see bridge lessons being offered as corporate had said they wouldn’t prior to the cruise. Bridge should be expected on a cruise of this duration. The string quartet every evening in the atrium was well received and glad to see them get two headline shows. The off-board entertainers and lecturers were pretty good. Ports and Shore Excursions - Took this cruise mainly for the itinerary and was not disappointed. 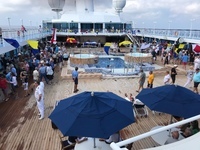 Arranged mostly private tours with the CC forum prior to embarkation. These were well done and received a more intimate experience than the Oceania sponsored trips. The tendering process was orderly with a sensitivity to private excursions. Oceania needs to cut their fees in half to be competitive. Met some interesting fellow travelers from various points of the world. By sharing evening dinner or Happy Hour you get to exchange in some great conversations. We enjoy Oceania and will return. Wanted the back of the ship for the extra deck size. Came in handy for room service breakfasts. When the ship was at full speed there was quite a bit of shuddering, if you are a light sleeper this cabin is not for you. The cabin is small relative to the typical veranda and I understand the shower curtain is scheduled for a door. Carpet was stained in places and sticky. Service attendants were great and quick to accommodate special requests. Enjoyed the laundry service. The best of over 20 cruises on 7 cruise lines! Best O trip and ship yet...!